If the U.S. Navy is really putting “Warfighting First“, then, well, why not just turn the non-fighting seamanship, navigation and ship-handling work over to civilian mariners? 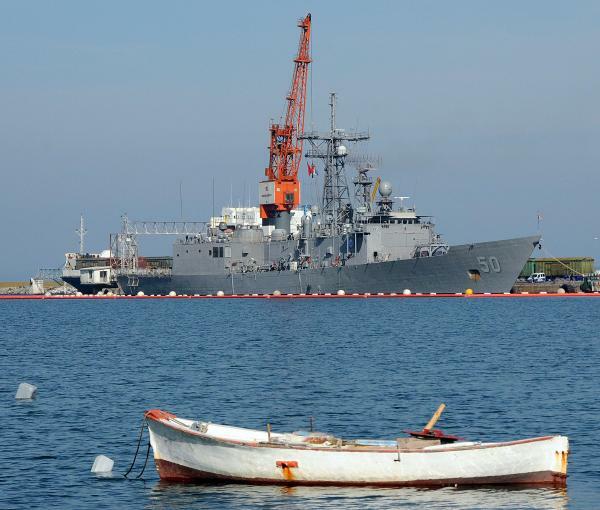 The connection between the conn and battle at sea is less intimate than ever–and civilian mariners are generally better qualified in ship operations, have more experience conning ships, and cost considerably less than their “warfighting-first” relatives. I don’t necessarily agree with such a step, but either the Navy continues handing more and more missions to civilian mariners, or the Navy, Congress and the taxpayer must make peace with the idea that that the rate of avoidable mishaps at sea will steadily increase, putting precious (and irreplaceable) ships and subs out of service (often at strategically painful moments, too!). Or we can pay for sufficient small ships, SSKs, operational budgets, and all the training and simulator time required to make the U.S. Navy a center of seamanship excellence. Yes, collisions and mishaps are a fact of life with any Navy–no matter how well trained–but until something changes, expensive and embarrassing mishaps are going to be a depressingly regular happenstance as America’s combat-systems-oriented (or staff-service oriented) officers continue to be awarded major commands with too little training and experience for too big a vessel. The Navy record has been erratic (As a broad and imprecise measure, undersea ops had a horrid mishap record in FY13, but a great one in FY 14, while the surface Navy, after a good stretch since 2008, didn’t do well in FY 14). 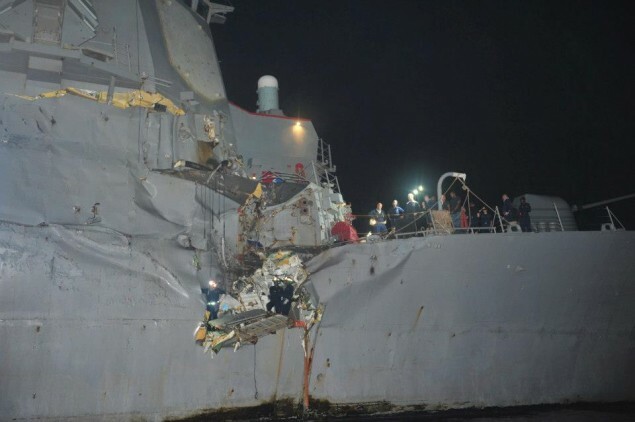 Regardless, over the past decade, an enormous amount of time, taxpayer money–and Navy careers–have been sacrificed to avoidable incidents (photos of a few notable mishaps accompany this post). The latest victims of a ship-handling incident, the former CO and XO of the LSD USS Tortuga, are likely spending a glum Holiday at home, filling out job applications and meditating on the $2.5 million dollars of damage done when the ship collided with the Thimble Shoals buoy in early October (In the annals of naval infamy, that’s in the neighborhood of where the battleship USS Missouri grounded in 1950). The cost of poor seamanship isn’t just in the expense of repairing dented hulls or in re-floating grounded vessels. Every mishap extracts a cost in national prestige, and could, conceivably dent and damage international relations. 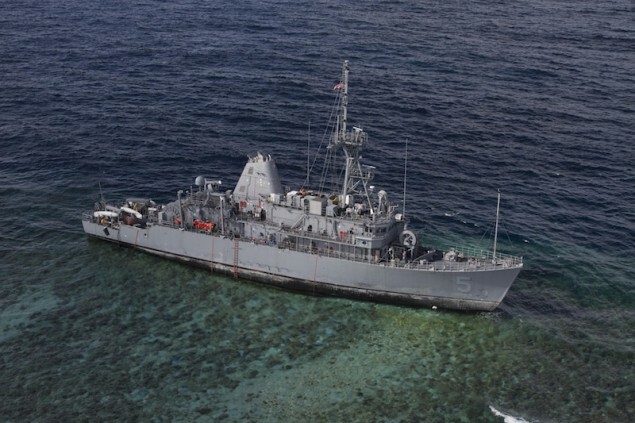 While lawfully operating in international waters in the South China Sea, USS Cowpens and a PLA Navy vessel had an encounter that required maneuvering to avoid a collision. So…Anybody get a little queasy after realizing that the Cowpens’ CO was relieved a few months later for, in part, hiding in his stateroom days after the confrontation and, in essence, abdicating command? Anybody wonder if the quality of his seamanship–and our conclusions from the entire incident–might be worth questioning? Poor seamanship can start wars. And maybe that’s ironic–there may well be a lot more U.S. naval officers out there who are more at home waging a clinical war from a console then they are navigating a crowded shipping channel or engaging in the close-in cat-and-mouse gamesmanship of sea lawfare. This isn’t a new thing. Naval seamanship has been concerning observers for some time. I’m reminded of a prescient article from an August 2006 U.S. Naval Institute Proceedings, entitled “Where Have All The Shiphandlers Gone? 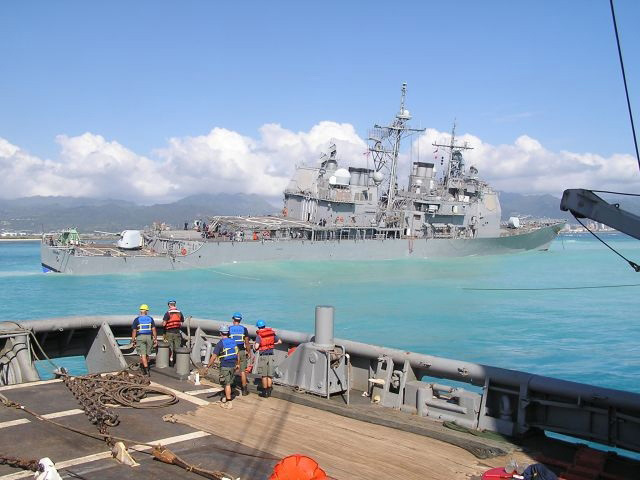 The piece, written by Retired Captain Stuart Landersman, seems to have stood up well–despite ongoing efforts to improve Navy ship-handling issues. But back in 2006, the good Captain noted how ship-handling went from a critical competency, “essential to a career officer’s reputation, professionalism and promotion,” to where it was no longer included in the Fitness Report and Counseling Record. Whereas the aviator goes through rigorous training, demonstrates that he can fly, earns his wings, and then accumulates many hours of flight time before he is considered a capable pilot, the surface warfare officer does minimal preparation, converts prompting into orders without understanding why, earns his SWO badge and then may not drive a ship again. These standards have been established by international conventions to which the United States has not only agreed, but has been in the forefront of promoting, urging, and encouraging application to world shipping. Very few U.S. Navy ship captains or officers are capable mariners, qualified by international convention and national law, experienced by way of requisite in-job time-at-sea, nor do they have the confidence that comes only by practiced seamanship evolutions. Valiant and capable combatants they might be, let us hope, but professional mariners they are not. If valet parking, sea buoy to sea buoy, and chauffeured driving is not in the future, and it should not be, the Navy must establish a clearly defined program with the objective of producing capable mariners…..If not, a future Navy may see warships operated by full-time civilian masters and mates who will drive the vessels to the scene of action so that combat systems can perform. Seamanship is one big reason to support the Navy’s acquisition of small, durable ships–like the Coast Guard’s OPC is set to be. The Navy simply lacks opportunities for naval officers to hone their skill on smaller (or simpler) commands (That huge Cold War fleet of 90+ FF and FFG-sized ships are gone forever, replaced by a far more challenging minimally-manned LCS.). The dearth of small ship command experience is a deficiency that, I suspect, will sneak up on the Navy–particularly given that most high-level decision-makers/commanders earned a measure of early career operational experience on a PC, FFG, gasoline tanker or something else small, insignificant and probably not too fun before moving to larger, more exciting commands. But they’re now aging out. And without small craft, training opportunities leading up to a major command will be limited to a brief stint as XO, under the tutelage of somebody who has an equally slim grasp of real-life experience conning a ship. It’s a recipe for accidents and mishaps. In the relatively recent past, the Navy had an ample inventory of robust, somewhat simple vessels to train the next generation of shiphandlers–small craft, small combatants and an entire fleet support train. 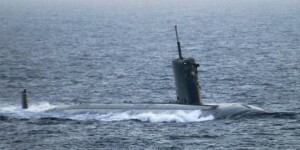 But the small combatants have largely retired, much of the fleet train has been scrapped–and the operating responsibilities for the remaining auxiliary hulls has passed to civilian mariners. Small or “simple” patrol and station ships are now the domain of the “National Fleet”–the Coast Guard, the Military Sealift Command and the like. This is where strong seamanship skills will be generated. This is where dashing captains will come from. So…either get back into operating these fleets…or…tap this resource for ship operations, and let the rest of Big Navy focus on the strange thing called “Warfighting”–Whatever that actually is these days. I don’t necessarily think tossing the Surface Warrior off the bridge is the right thing to do, but if warfighting at sea is, today, less about seamanship and more about operating a console, why not lay it out there for discussion? And..if civil service mariners are better sailors and cost less, then, well, let’s discuss it. Or SWOs will wake up to a Navy full of railgun-armed JHSVs, AFSBs, and a bunch of other strange civilianized exotics…that are happily–and relatively safely–being run by civilians. That doesn’t even include Destroyer Escorts. Today, the US Navy is no longer honest the role of it’s only small surface warships in production (the “Littoral Combat Ship” tag is a political designation, not a functional one; they’re Offshore Patrol Vessels), and they can’t even build them right either. How many Admirals are there in the US Navy today, just wondering? And Generals in the AF, Army, Marines, and CG if anyone knows. The total GO/FO count is higher than WWII. Blame Goldwater-Nichols for the COCOMs being 4 stars and the attendant train of 3s, 2s and such. DOD agencies have a distressingly high count of flags for extremely marginal reasons especially when not explicitly combat support. I saw this coming when they got rid of the YPs at Newport; as a senior SWO, and a Merchant Mariner, I can say that relegating seamanship to the civilian mariners is NOT the answer….and just for the record, I have had an equal share of crappy civilian mariners as well. What happened to the YPs? Aren’t they getting recapitalized? Or were new ones finally tossed as too expensive? After Afghanistan was successfully invaded in 2001 from Tampa, why are command ships Mount Whitney and Blue Ridge still in commission? Think how much crew and money that would free up. Agreed but they’re not just Admiral Barges, though. A large part of the problem is short tours and rotation out of a job the JO has just barely learned. Getting the all the “right” jobs on your ticket punched is more important than mastery of the basics. The Navy could save billions with nothing more than extending the average tour by 6 to 12 months. And how much has that JO been allowed to learn by the CO who is, him or herself, eager to get the next “right” job….. The answer is not civilians to run our ships, it is to train our Sailors to be proficient and competent. And maybe to change how an officer’s career path is determined. I agree with the comments on lack of sea time and Division Officer level training, although the surface navy has brought back the 8 week Basic Division Officer Course (BDOC) and has instituted the 4 week Advanced Division Officer Course (ADOC) for second tour DivOs. I think we can go further. Make the BDOC course longer and concentrate on producing Officers of the Deck. It currently takes over a year on board for most officers to qualify OOD due to reduced underway time – accelerate that by intense schoolhouse based simulator training and applied school ship training to make first tour DivOs better watch standers earlier. Of course, increased underway time is a must to not put our ships at risk due to low experience levels. 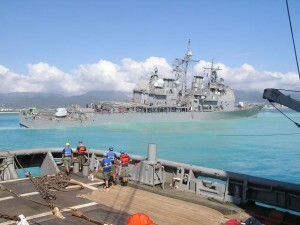 The surface Navy is instituting many initiatives to increase tactical proficiency, including the Warfare Tactics Instructor (WTI) program and increased schoolhouse training – these initiatives need to continue when budget pressures look for savings – we can’t go the way we went in the early to mid-2000s. Maybe it is time to divide war fighting, ship driving, and engineering in the Navy. Our Royal Navy cousins are widely recognized as better mariners and tacticians. I believe that a large part of that is because they specialize rather than trying to make all officers into jacks of all trades. My experience from talking to thousands of Navy Officers during my career is that a large majority, not all, would like to become an expert on a specific track rather than having to punch their tickets on the bridge, in CIC, and in Engineering. With the complexity of today’s warships, we are asking a lot of our officers, and I believe we are sub-optimizing our officer leadership by forcing all officers to do all things in order to make command. Great comment. Thank you for reading sir. Very astute comment as interesting as the article itself. For hundreds of years the Royal Navy has made a fetish of seamanship and navigation excellence. These were essential skills in the era of their supremacy the age of sail and became ingrained as a tradition. Perhaps there is some things we can learn from them as well as some things they can learn from us? Long past time IMO. This harks back to the (sorry) nuke takeover of the SWO community, and the consequent reflection of the KOG’s requirement that everybody be a nuclear engineer first and everything else second. Of course we could never afford that, but the attempts at emulation (PMS 301, OPPE cycle etc.) inevitably drove us into a engineering centric officer corps–and if you don’t believe that, look at the prescribed STEM percentages for NROTC scholarship and USNA accessions. This is not to suggest that CO/XO should not have a firm appreciation for the capabilities and limitations of their engineering plants and the people who operate them, but maritime competency does not demand an engineering background. I served an exchange tour with the RCN and operated extensively with the RN. Both experiences pretty well convinced me that they have it right on splitting out the engineer branch from the seaman branch. For the record I commanded an AOG as a LT and then an AO subsequently, and went to SOSMRC. Those experiences confirmed my inclination to emulate the RN in this respect. For my money JPJ had it right in stipulating that being a capable mariner is the bedrock upon which being a naval officer must be built. The surface navy has chosen to focus the professional training of its officers at the Department Head (Lieutenant) level vice the division officer (Ensign) level for principally financial reasons since 1975. It costs much less $$ to produce a new SWO than it does to produce an aviator, a submariner, or a SEAL. The surface force only spends significant $$ to train officers once they have agreed to spend more than their initial commitment. 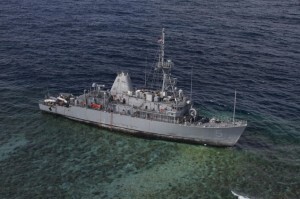 Reductions in the size of the fleet may now provide the incentive for greater initial training, but the Navy’s severe reduction in the scope of basic surface warfare training program in the mid 2000’s may hamper this effort. Thanks for the comment. I share your concern about the state of training and the impact of past choices might have upon any reconstitution of surface warfare training. That said, navigation/ship-handling training was not as thorough nor as tough as, say, the UK’s Perisher course for sub COs. Not saying that surface navy should follow the UK template, and make some kind of grueling career-killing exercise to impart shiphandling skills, but maybe some additional rigor would be OK…just throwing it out there for discussion! I do not disagree with any of your points or comments. The Surface Navy really needs to re-invest in training JO’s. The fleet is getting smaller as are individual crew sizes of ships. The combination ought to demand a greater initial investment in junior officer training. The BDOC course in fleet concentration areas is a significant improvement from the failed CDROM-based OJT program from the last decade, but is not yet a real replacement for the old Baby SWOS program cancelled in 2003 due to budget cuts and extremely shortsighted thinking. USS Guardian cost $300 million… and was lost by and large due to very poor practical seamanship on part of its JO navigator. SWO community is being very myopic when it comes to skimping on JO training. Sure they save on training money, but they are beating their ships to hell. You bring up a good point hokie–JOs in small commands will screw up–some royally. But with more smaller ships or more less critical ships, there might be a better ability to distinguish between a dramatic screw-up like the Guardian grounding or a more minor incident like Fleet Admiral Nimitz’s early-career incident. 1. Navy is sending first tour ensigns to LCS. Young guys and girls with little to no practical seamanship. 2. LCS will be operating close to shore; right in the middle of busy shipping lanes, shallow water,etc. 3. Reports indicate that LCS crew are routinely overworked and fatigued. Mistakes will happen. 4. The LCS seaframe is not anywhere near as damage resistant as a CRUDES. Any collision will be very bad. If SWOs don’t get serious about their core competencies – then Navy probably needs to accept that it is going to lose a few LCS during normal peacetime operations. Not a fan of the LCS manning scheme. I’ve greeted LCS at piers and seen crew come off the ship a tad tired. But, that said, compare what the JHSVs are doing with a far smaller crew. The bottom line is that if officers have pushed for only one year in three at sea (for lifestyle, retention and quality of life reasons), and if major ship command is a once-in-a-career experience, and if we have more admirals than ships (let’s not even talk about how many captains and commanders we have), and careers are now only 20 years long than 30, and if we emphasize joint operations over all, then we’re going to have a second rate navy. The WWII era admirals have 4-6 commands before making admiral and spent 2/3’s of their time at sea, had extensive professional education in between sea tours, had 30 year careers, and seemed to actually like being in the Navy, understanding that it meant sea duty. Ship handling may be less critical today than in the past, but you can’t expect civilians to do war duty, and it is absurd to say sea-going officers can’t learn again to handle ships. It would be interesting to hear their comments. Certainly, there was a smaller, tighter officer corps in the pre-WWII Navy, which was still the second largest in the world, and that maintained a long tradition of small ship command en route to the senior ranks. Even into the post WWII period, when again we admittedly had a lot of ships, officers had multiple commands prior to making admiral. There is no basis for the degree of flag officer inflation and the massive staffs – which incidentally characterize the entire structure of the national security bureaucracy(civilian and military) – that we currently have. I’d also suggest that the up-and-out promotion system hasn’t helped much either. More generally, though, I would suggest that we are not exactly reaping the benefits of warfighting excellence even as we have sacrificed traditional ship-handling skills, and I would dispute in any event, that there is an inherent trade-off between the two. ASW is in terrible shape, MCM is likewise in terrible shape, and many of the major ship-building programs are in poor condition. No one has fought or prepared for an actual war at sea since 1945 and 1991, respectively. Two decades of operating in a completely permissive EMCON environment, with total space and air superiority, and in which most operations have consisted of bombardment of shore targets that were unable to defend themselves has not exactly left the force prepared for an actual war, and I would suggest given it a very unrealistic mindset. Sir, on this last point, I would be interested in your thoughts in regard to the future of the Navy, as raised by the subject of the upcoming debate that is scheduled to be held next Thursday evening at the Naval Academy Museum, to wit, the efficacy and cost-effectiveness of the nuclear-powered aircraft carrier as a “platform” for “power projection”. It strikes me that there is something arrogant and foolish about dwelling on the utility of our Navy for such a purpose. “Power projection” – as in we have power; you do not. Watch while we show you. Resolved: That the mission of the US Navy will be best served by continuing to own and operate nuclear aircraft carriers. Terms always have a way of skewing debates. I am appalled to learn this dirty little secret about the navy. It is shocking to know that so many expensive ships are being sailed by glorified amatuers who have trouble navigating buoy lanes. To not even include ship handling in core competencies testing is completely unacceptable to me. I agree with the option of separating ship handling from warfighting. To ensure that level of competency requires a separate dedicated career track. In the old gun navy, war fighting and ship handling were of course integrated. You had to point the ship in the right direction constantly to line the guns up. You had to dodge and weave a rain of steel shells and bombs. Today, you can’t dodge a mach 3 ASM. I say experiment with a few civilian contract crew fighting vessels in terms of cost and performance. Been there, done that. One of my overseas deployments was aboard exactly such a ship, operated by a civilian contractor with a military detachment on board for mission-specific activities. It worked for what it was — non-combat — but that experience highlighted a glaring issue that cannot be ignored if we start putting civilian crews into combat scenarios: government contracts are, by law, awarded to the lowest bidder. That is necessary in order to keep personal dealing out of the picture, and even then is only marginally successful. But that “lowest bidder” requirement ensured — and yes, I mean ensured, if not downright demanded — that the civilians who were hired to operate the ship were the absolute bottom-of-the-barrel collection of misfits and ne’er-do-wells who were willing to accept bargain basement pay and benefits just to have a job. You don’t get top flight talent by offering bottom tier pay and benefits. And further, once you start using civilians to operate combat ships in war at sea, how are they functionally different from active duty Navy members? The same stresses would apply, the same dangers would threaten, and hence the same requirements for training and performance would be needed. I don’t think the author here seriously expects such a division of responsibilities to ever be seriously considered. He’s using hyperbole to promote his argument that the loss of smaller ships has deprived the current Navy of command opportunities for mid-grade surface warfare officers, resulting in commanders of larger vessels who lack the skills and experience to be successful at their more demanding positions. The answer is obviously NOT to engineer a Navy in which nobody knows how to operate a ship. You’re on to me, Itsallbaloney! I AM putting this out there for discussion, so…no need to get defensive! We need to debate the MSC. Read the CSBA report. Look at how many near-warfighting things that MSC ships are ALREADY being asked to do. What’s going to happen when we put railguns on JHSVs? I’d love to know, but nobody’s talking about it in public. I DO believe the Navy would benefit from more commands for JOs–smaller ships or auxiliary ships are one option. Better simulators and tougher training and more operational time is another option–but, at this point, I think–as unlikely as it is–procurement of more small ships/auxiliary ships are more likely than the latter option. My point was: contract management for quality makes sailing a ship seem fun, easy, and low risk. Who is going to do this? TYCOMs? When they can’t even train to their core competencies? There are legal issues with putting civ-anything on combat vessels. Both US code, and international. Not my area of expertise. Having a commission really matters for some things. Government contracts are _NOT_ awarded to the lowest bidder without proof of quality. What must it take for this myth to die? Find a contracting officer (not necessarily your nearest chop) and ask. However, I’ll concede this: If you bring contract workers onto combat vessels, then SURFLANT/PAC will have to develop a contracting competency…if these Sailors can’t sail, why is having them manage a contract going to go well? I don’t dispute your point, but will argue that it in no way disproves mine. The civilian mariners who ran that ship were minimally competent to perform the mission. But that was a non-combat mission, and “meets the minimum standards” is not how you win wars. “Minimally qualified” is still a long way from optimal performance. My viewpoint differs from most of those commenting here because I have zero experience or expertise as an SWO. I was enlisted, and my field was aviation maintenance. I spent twenty years cussing those who expected me to maintain $20M aircraft with 99cent tools. So I have nothing to offer regarding SWO career track, career length, or effective training options. I’m only here to say, “been there, done that, here’s how it worked.” My argument is anecdotal, but it’s also based on real world experience. And that experience leads me to conclude that civilian mariners are not a viable replacement for uniformed military in a military operating environment. Oh? That’s news to me. Had quite a few contracts in my time awarded to the lowest bidder who, ah, demonstrated proof of quality, moaned and groaned to the government customer (to no avail), only to have the government customer come back, in a frenzy to get work fixed that the original bidder couldn’t do or couldn’t do right. Right, so contracting officers can select for “best value” when they have customer feedback that has been substantiated. Not just lowest bidder. It allows them to avoid a known poor performing contractor. However, if the contracting officer is harried (which they all are), or if customer feedback is lacking or of poor quality (which it often is), the feedback for quality suffers. If we go to contracted deck officers, then surface forces will give away much direct control and have to manage a quality feedback system. Is the XO mad about the way the watch was stood? So what, fill out this customer feedback form and we’ll put it with the others for a civilian or at best a Supply Corps officer to evaluate in several months when the contract is up for option or renewal. What happens during the next CR? Also, who on board can be registered as a COTR and doesn’t have a relationship with the company? SWOs, stay away from contracting deck officers! The cure will be worse than the disease. JHSV is not a combatant. Neither is LCS presently (no mission package). If LCS crews are tired now – what will it be like after a multi-day ASW mission against a hostile sub?